However, new research led by scientists at the University of Bristol has revealed that the colour pattern does more than simply signal “danger”. Counterintuitively, it also works as camouflage. He said: “Effective as warning signals are, it’s not necessarily the best strategy to be maximally conspicuous. “Certain predators have evolved tolerance of toxins that would be deadly for humans, and some individual predators may have not encountered the warning signal prey before (a dangerous mistake for the predator, but also for the frog). 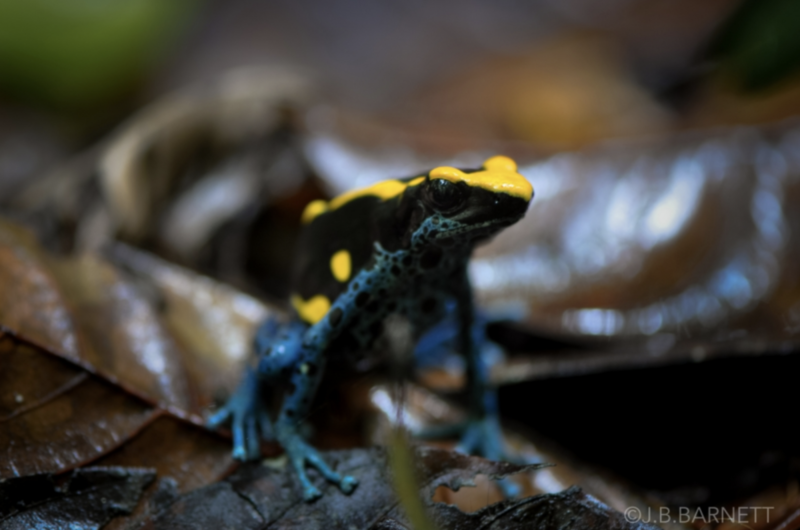 Combining fieldwork in the jungles of French Guiana, computational modelling, and laboratory visual search experiments, Barnett and colleagues from the University of Bristol’s School of Biological Sciences and the School of Experimental Psychology investigated how the Dyeing Dart Frog uses its colours to balance the benefits of effective warning signals with the advantages of concealment. The frog’s pattern, therefore, allows it to get the best of both worlds: high fidelity camouflage until a predator discovers it, at which point its bright, highly salient, warning signal becomes clear. Co-author Professor Innes Cuthill from the University of Bristol added: “How many other animals use ‘distance-dependent coloration’ to balance competing evolutionary pressures is yet to be explored.